Although black tar heroin is a crude and unrefined substance, it can be more potent than other types of heroin and addictions are spreading across the United States as more of this substance is trafficked in from the Latin America. The main goals of treatment for black tar heroin are to reduce harm and provide maintenance-oriented treatments and abstinence-oriented treatments that begin with the process of detoxification. Why is Black Tar Heroin So Potent? The potency of any heroin varies from the beginning of its opium source and all of it is illegally made with manufacturing changes causing the potency of these substances to skyrocket. The difference with black tar heroin is that it is produced with acetic acid versus acetic anhydride which results in a greater mixture of the other psychoactive opium derivatives 6-MAM (6-monoacetylmorphine) and 3-MAM (3-monoacetylmorphine) remaining in the drug. Heroin is produced from the morphine alkaloid of the opium poppy plant, which is rapidly metabolized, first, to 6-MAM (6-monoacetylmorphine) and further to morphine when consumed. The 6 -MAM is more potent than morphine because it penetrates the brain and central nervous system (CNS) more quickly. Final products of black tar heroin contain more of the 6-MAM than other, more refined, heroin substances, along with 3-MAM which helps facilitate longer binding activities to the opioid receptors. 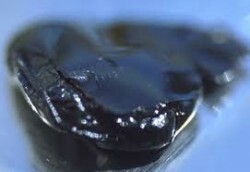 Black tar heroin is more potent than other forms of the drug. According to the National Institute on Drug Abuse, about 23% of the individuals who use heroin become dependent on it and in 2011, there were an estimated 4.2 million Americans, 12 years of age and older, who had used heroin at least once in their lifetime. Black tar heroin users are finding themselves more dependent, more quickly, both physically and psychologically. The physical aspect of black tar heroin dependence is the state of needing the drug to function or depending on it to survive. Tolerance is another physical aspect where the user needs to consume more or repeat the dosages several times a day to avoid feeling bad (withdrawals). The psychological aspect of black tar heroin dependence becomes more complex involving cravings, uncontrollable use of the drug, social and environmental consequences, and constant disruptions in mental health states from cravings and obsessions to intoxications and withdrawals. The cycles become vicious repeats of themselves and the adaptations to heroin in the brain leads to the reinforcement of behaviors to use. In an effort to treat black tar heroin and other opioid addictions, treatment programs must be able to address the unique needs of the addict helping them to regain functionality, while helping them to abstain from using opioids. We have learned from studies of heroin addiction treatment programs with methadone, that medication assisted detox and medication maintenance therapies combined with counseling, behavioral therapies, harm reduction education and interventions, and psychosocial support show the most promising results. Medically supervised withdrawal using methadone or buprenorphine reduces cravings and withdrawal symptoms and can be gradually tapered off over several days. Other antagonist drugs such as naloxone or naltrexone may be used in detox methods for rapid detox or in combination with non-opoid medications to ease withdrawal discomfort. Detox from opioids using methadone or buprenorphine can be extended for longer periods under medication maintenance programs as determined by the addict’s willingness to comply with the treatment programs, their treatment progression, and concerns regarding relapse. Black tar heroin addiction treatment should not be rushed and the longevity of these programs are beneficial to keeping the addict engaged in treatment and helping them to regain control of their life, while managing urges to use other opioids. Other aims of this type of treatment are to improve functionality while reducing potential harm, whether to the addict or to others such as preventing the spread of diseases through needle sharing. Black tar heroin often contains impurities and because of the nature of its substance, repeated injections can have serious medical consequences along with high overdose and mortality rates. Counseling and behavioral therapies are necessary elements of treatment to help the addict identify, avoid, or cope with the issues surrounding their addiction. Cognitive behavioral therapy helps them to identify thoughts that lead to behaviors and addictive habits which they can change or learn to avoid “triggers” to. Contingency therapies promote progress in treatment on a reward basis such as producing a heroin free urinalysis or achieving a specific treatment goal. There are often co-existing mental health concerns, environmental issues such as abuse, violence, or homelessness, and social difficulties such as relationship problems, unemployment, financial difficulties, and legal problems that can contribute to black tar heroin relapse if left unresolved. By providing medical and psychiatric services along with outreach support the black tar heroin addict can gain improvements in health, functionality, productiveness, and integrity that play an important role in long term recovery outcomes. Outreach support services may include access to resources for family counseling, domestic violence or anger management counseling, legal counseling, or transportation, housing, financial, educational, vocational, or employment help. Self help groups such as Alcoholics Anonymous and Narcotics Anonymous are highly advocated for relapse prevention and long term recovery. These groups help the people to share the common concerns and interests of addictions between those who are undergoing the similar recovery circumstances.